Variety of cards and technologies facilitate current border crossings but will they will be accepted if and when the PASS Card arrives? The jury is still out on whether the other border crossing cards currently in use will serve as a substitute for the proposed PASS Card. The launch is currently mandated for Jan. 1, 2008, though pending legislation could delay this start. The Department of State is reportedly examining existing border credentials to see if they would meet the requirements of the Western Hemisphere Travel Initiative. This Mexican border card, first implemented at Otay Mesa, Calif. in 1995, is designed for what U.S. Customs and Border Protection (CBP) calls “pre-approved, low-risk travelers.” Because they can utilize a dedicated lane, participants have a shorter wait time even at the busiest time of day, according to CBP. That’s because critical information required in the inspection process has already been provided in advance. This also saves about 30 seconds on inspection time. Applicants must voluntarily undergo a background check against criminal, law enforcement, customs, immigration, and terrorist indices. They’re also fingerprinted and personally interviewed by a CBP officer. Approved applicants are issued an RFID card that will identify their record and status in the CBP database upon arrival at the U.S. port of entry. All data is stored in the CBP database, not on the card, and is not transmitted via RFID. In the past, an RFID transponder was also affixed to the applicant’s vehicle to give SENTRI users access to dedicated lanes at border checkpoints. The transponder is now being replaced with an RFID-equipped label that is adhered to the vehicle’s windshield. When an approved international traveler approaches the border in the SENTRI lane, the system automatically identifies the vehicle and the identity of the occupants of the vehicle. The applicant must provide originals and copies of evidence of citizenship, such as a birth certificate or passport; a valid passport or visa; proof of U.S. residency; a driver license; current vehicle registration; and evidence of employment or financial support. If DHS and State hold to their original plan to charge less than half the cost of a $97 passport for the PASS card, it will be a bargain compared to SENTRI’s $129. However, the main SENTRI benefit is speed of entry. This card, nicknamed the “laser visa,” is a laminated, credit card-style, machine-readable document with several security features, including biometrics and optical storage. Valid for 10 years, the card enables Mexican citizens to enter the U.S. and is considered both a border crossing card and a visitor’s visa. Most Mexican visitors to the U.S., whether traveling to the border region or beyond, receive a laser visa. If coming from outside the Western Hemisphere, a passport is required. This card is a joint effort of the Department of State and the Citizenship and Immigration Services in the Department of Homeland Security to comply with the Illegal Immigration Reform and Immigrant Responsibility Act of 1996 (IIRIRA), which requires that every border crossing card issued after April 1, 1998 contain a biometric identifier such as fingerprint, and be machine-readable. Laser visa applicants must demonstrate that they have ties to Mexico that would compel them to return after a temporary stay in the U.S. United States consular officers look for evidence of strong family, business, or social ties. The visa application fee is $100. Children under 15 pay $13 but the child must have at least one parent who holds a laser visa or who is applying for a border crossing card. FAST is a border accord initiative between the U.S., Mexico and Canada and is designed to speed up commercial carrier shipments into and out of the three countries. It offers expedited clearance to carriers and importers enrolled in Customs Trade Partnership Against Terrorism (C-TPAT). In developing FAST, the three agreed to coordinate commercial shipments clearance at the borders. FAST streamlines and integrates the registration processes for drivers, carriers, and importers; minimizes paperwork and ensures only low risk participants are enrolled as members. The initiative reduces customs information requirements and provides dedicated lanes at major border crossings. In addition, FAST participants don’t have to undergo cargo inspections as frequently as those not participating in FAST. Applicants identified as low risk are interviewed, have their original identification and citizenship documents reviewed, fingerprinted and are digitally photographed. They are then issued an RFID-enabled FAST-Commercial Driver Identification Card. FAST participation requirements along the northern and southern borders are similar with minor exceptions. For the northern border, the driver, carrier, and importer must all participate in the FAST/C-TPAT programs in order to be eligible for FAST processing. On the southern border there are two additional requirements; 1) The manufacturer must be an approved C-TPAT participant, and 2) it must also adhere to CBP high security seal requirements. NEXUS, a joint customs and immigration program between Canada and the U.S. for pre-approved low-risk travelers, is an alternative inspection program that allows pre-screened travelers to be processed with little or no delay by United States and Canadian border officials. Approved applicants are issued a photo-identification/proximity card. Participants cross the border in a dedicated lane where they present their NEXUS card and make a declaration. They are then released, unless chosen for a random inspection. Individuals can qualify to participate in NEXUS if they are a citizen or permanent resident of the U.S. or Canada, or if they are a citizen of a country other than Canada or the U.S. who plans to temporarily reside in either country for the term of their NEXUS membership and who pass an Interpol criminal history check. Applicants need to complete only a single application form. Qualified applicants are required to come to a NEXUS Enrollment Center only once, for an interview and issuance of a photo-identification card. All applications for a five-year membership are sent to a Canadian Customs Processing Center along with the $50 U.S. or $80 Canadian payment. Both the United States and Canada must approve an individual’s application. The limited NEXUS Air is a pilot project of the Canada Border Services Agency (CBSA), and U.S. Customs and Border Protection that facilitates quick entry into Canada and the U.S. for pre-approved, low-risk air travelers. The pilot, that is testing the viability of iris scans, was first implemented at the Vancouver International Airport in British Columbia in late 2004. NEXUS Air allows the traveler to clear customs and immigration by simply looking into a camera that recognizes the iris as proof of identity. The iris image is captured with a digital black-and-white camera without bright lights or lasers. Members receive an identification card and use the self-serve kiosks at the Vancouver airport where their iris image is verified. Members can then enter Canada or the United States without further interaction with customs and immigration officials unless randomly selected for inspection. 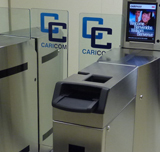 NEXUS Air is part of Canada’s CANPASS Air’s iris recognition program, which has been implemented at several other Canadian airports. Individuals can qualify to participate in NEXUS Air if they are a citizen or permanent resident of the U.S. or Canada, or someone who can demonstrate a need to participate in the NEXUS Air program. Both the U.S. and Canada must approve an individual’s application. The fee for a one-year membership in NEXUS Air is $50 US or $80 Canadian.